Shamrock ring is a petite design that is cast in yellow gold. 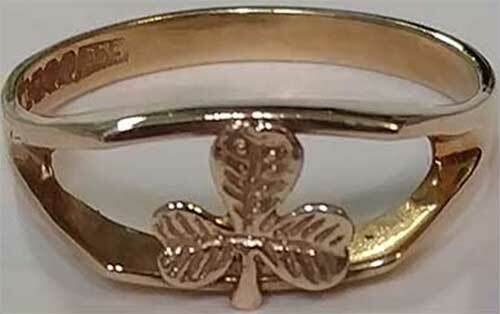 This gold shamrock ring has been hallmarked by the Irish Assay Office at Dublin Castle. 9ct is .375 pure gold and was at one time the Irish standard for export to the United States. This 9K gold ring features an embossed herringbone design on the shamrock. 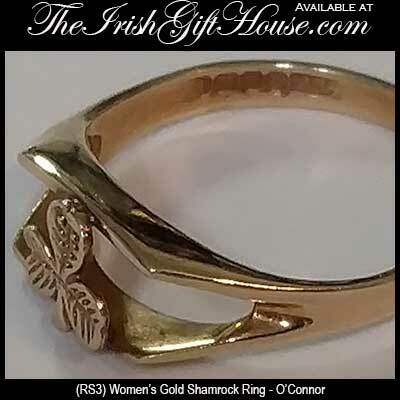 The small gold shamrock ring measures 1/4” tall in the front and is gift boxed with a shamrock history card, complements of The Irish Gift House. This women's shamrock ring is available in limited sizes and it was made in Ireland by O'Connor Jewelry. Sterling silver shamrock ring is enhanced with Connemara marble along with marcasite stones. Sterling silver shamrock ring features peridot and rose zircon stones as the leaves. Sterling silver shamrock ring features green CZ stone leaves and white CZ stones along the front of the ring.